A long overdue write-up of an intriguing selection of wines and pairings on a great night at La Malaje, including as a highlight the last of Williams & Humbert’s cracking 2009 finos, their excellent Alegria manzanilla and Don Zoilo amontillado, but also some wines you don’t often see in Spain: favourites in Denmark, Ireland and the UK. One of them the Winter’s Tale, a lighter, finer, younger, medium-sweet medium (82 gr/l), from six year old oloroso with a reasonable shot of pedro ximenez. I have often said that the sweeter styles are not really my bag and I am not going to pretend to enormous enthusiasm but this was quite striking with very nutty aromas and a nice combination of raisiny sweetness and salinity and freshness. Very gluggable stuff as Shakespeare would no doubt have remarked. Interestingly, it came up early in the evening and was imaginatively paired with a salad of smoked mackerel. It must be said the combination of smokey salty sweetness in the mackerel and sweet nutty saltiness in the wine worked pretty well, and the acidity of the salad meant you didn’t need much from the wine. If you were being picky you would say that maybe the wine took over a little bit as the glass wore on and the food ran out but on the basis of a quick taste of each this was evidence in favour of drinking sweet wines before the dessert courses. Another wine you don’t see a lot of was the Oloroso Lacave, a young and pretty light oloroso – I didn’t make a note of how old but it was probably not markedly older than the Winter’s Tale since it didn’t have any great concentration or acidity to it. Did have that same pleasant nuttiness though – not as pronounced a hazelnut as the Fino de Añada but in that direction. Another imaginative pairing – with the gamba roja (the english translation of “red prawn” doesn’t do it justice) – and again the nuttiness was a nice complement, although it went even better with the top class bread and olive oil we had. 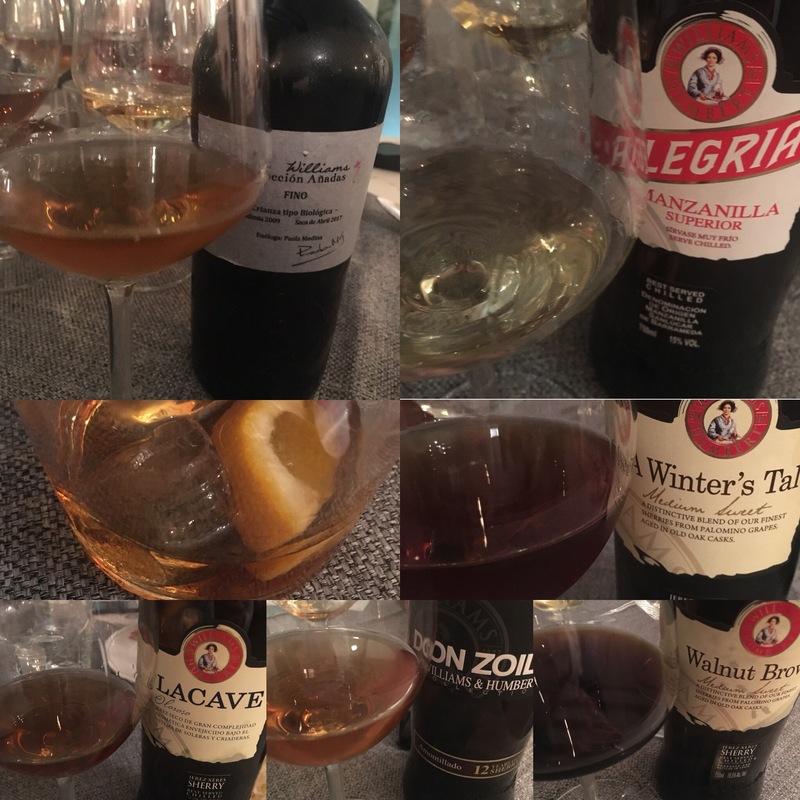 After that the wines were of a more familiar stamp – the afore-mentioned Manzanilla Alegria, Amontillado Don Zoilo y Fino de Añada, until the finish and the Walnut Brown. 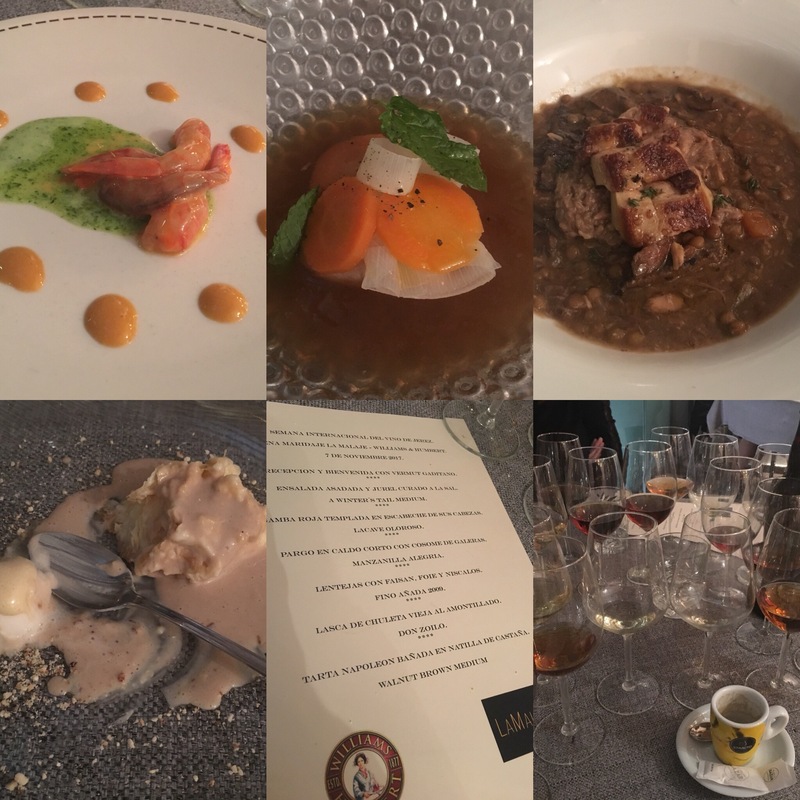 This time the sweet wine was paired with a desert – a Tarta Napoleon in chestnut custard – and although my dessert was gone so quickly it is hard to judge the pairing it certainly seemed alright. Now the Walnut Brown is an old favourite in my family (if not of mine). It is a sweet oloroso or cream (105gr/l) but interestingly enough has not just palomino and pedro ximenez but also at least a touch of moscatel – and once you know it is there you can really tell it is there, with aromas and flavours of what I identify as stewed tomato. Makes for a more complex palate than the average cream and maybe the varied flavours help balance the sweetness. A terrific dinner all round, and if it hasn’t converted me to sweet wines as such there is no doubt that it was a chance to try some wines I otherwise wouldn’t.